The South Lhonak Glacier drains east from Lhonak Peak into Sikkim from the Nepal-Sikkim border. The glacier begins at the border at 6500 meter and ends in a lake at 5200 meters. In 1933 the Mount Everest Expedition led by Eric Shipton explored the area. They traversed across the border and down the Lhonak Glacier finding only moraine covered cover glacier and no lake. 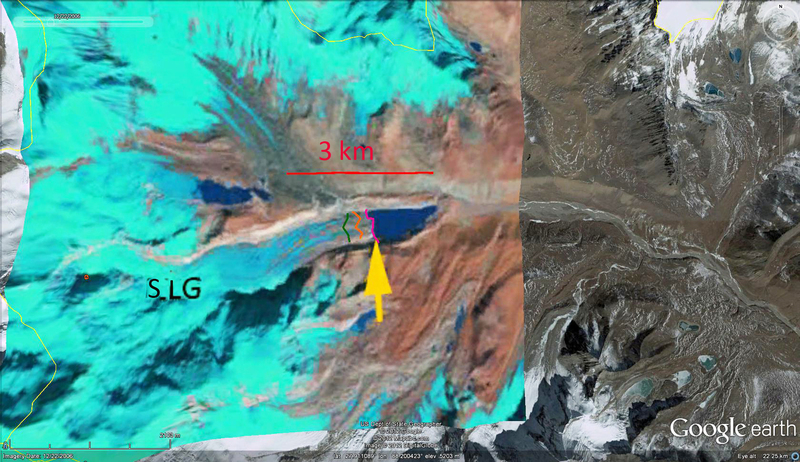 Comparison of Landsat and Google Earth images from 2000-2011 indicate the expansion of the lake as the glacier has retreated. 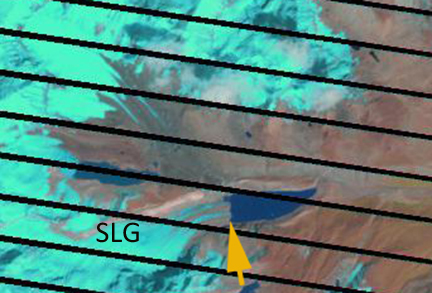 The first three are Landsat images from 2000 (top), 2010 (middle) and 2011 (bottom), indicating the expansion of the lake and glacier retreat. 2013 Update A paper just published in Current Science by K. Babu Govindha Raj1, S.N. Remya andK. 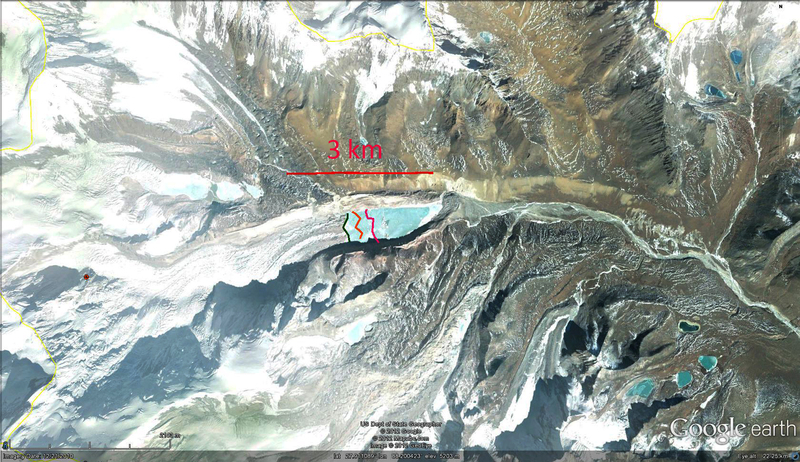 Vinod Kumar reports on this lake expanding by 1.9 km due to glacier retreat from 1962-2008. The next set of three are from Google Earth with a Landsat image from 2000 overlain in GE (top), 2006 GE image (middle) and 2010 GE image (bottom). The 2010 terminus is marked by green line, 2006 orange line and 2000 magenta line. The glacier retreated 350 meters from 2000 to 2006 and 250 meters from 2006-2010. The net 600 meter retreat for the decade is 60 m/per year. 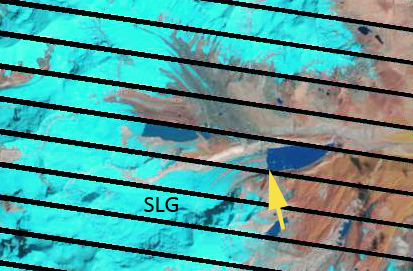 The 2006 image has red arrows indicating the large moraine behind which the lake has formed, and which Shipton found the glacier pressed up against. The retreat from 1933-2010 is at least 1800 meters. Clearly the retreat in the last decade is much more rapid than previous. The specific hazard is identified by Babu Govindha Raj et al (2013), the lake outburst probability is a very high value of 42% and peak discharge estimated at 586 m3/s. The retreat fits the pattern of other glaciers in the area reported by Raina (2008) and including Zemu Glacier and Changsang Glacier. In Sikkim 26 glaciers examined were retreating at an average rate of 13.02 m per year from 1976 to 2005. An example of this kind of retreat from Bhutan is Theri Kang Glacierand Changsang Glacier in Sikkim is another example. 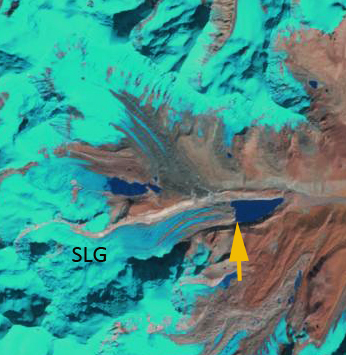 A closeup examination of the terminus region of the Lhonak Glacier indicates a well incised supraglacial stream (on surface of glacier), indicating relative stagnation. 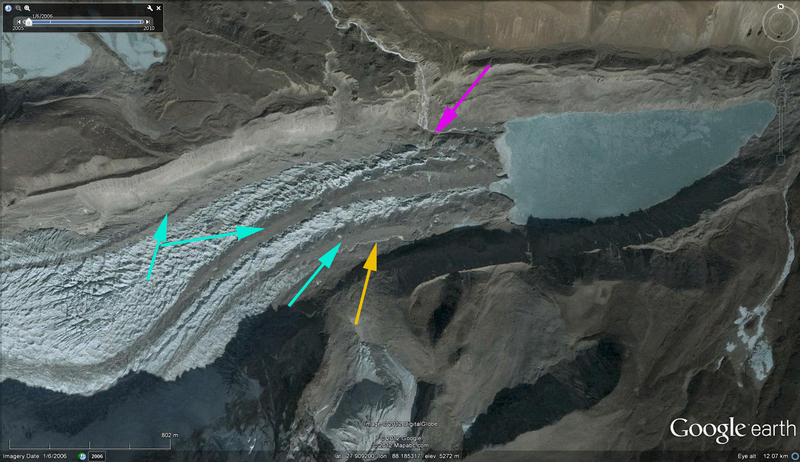 Three areas where debris cover has protected the underlying ice leading to a prominent ridge on the glacier,(light blue arrows) again an indicator of stagnation. Finally the magenta arrow identifies a side stream valley that adjacent to the glacier and lower than the glacier, another indication of stagnation. 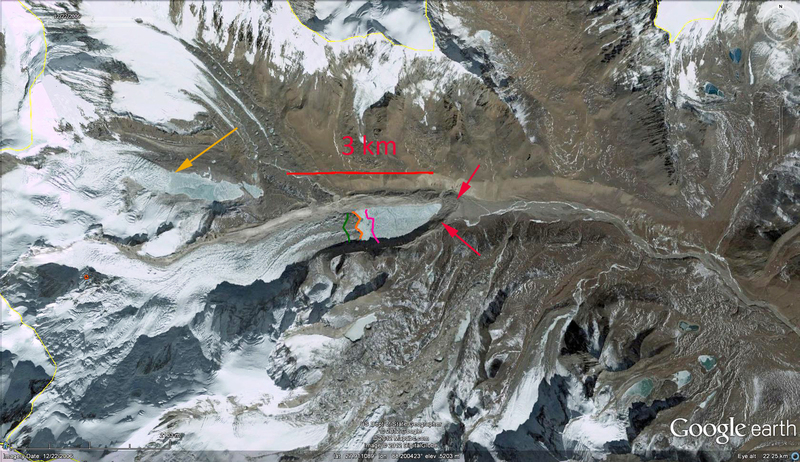 This entry was posted in Glacier Observations and tagged India glacier retreat, Lhonak glacier retreat, sikkim glacier retreat. Bookmark the permalink.